First I would like to share some wonderful news about myself. 😉 I was chosen to be interviewed and featured by Cliche Magazine and now I am in the Aug-Sept issue BLOGGER SPOT LIGHT. The full interview is below or you can visit Cliche Magazine to read more. This is my 9th month blogging. I still have so many questions, confusion and struggles about this gig. But I started to feel more and more comfortable about my fashion blogger’s life. 😉 One day a new blogger asked me, when was the first time you got a sponsor? Well, I guess I will never forget that moment. That day was my two month blogging anniversary and I received a lovely email from Leslie (The owner of My Arm Charms) to ask me if I would like to work with her online bracelets boutique. My first thought was yes. My second was Hell yes! Our partnership is still going strong since February. That’s longer than a lot of relationships! Lol! We even managed to meet one evening a couple months ago. Leslie lives in Atlanta. GA and I live in Michigan, but happened to be in her neighborhood for a conference and we got together. We had a very nice dinner and had so much to talk about, our lives, loves and passions about fashion. It really felt like we were childhood friends that hadn’t seen each other in years! Here and here are some posts about My Arm Charms. They are super cute bracelets and very good price! I mean most of them are under $10 kind of good price. So far, after more than a half year, all my bracelets are still looking like new. 1. Join My Arm Charms mailing list, leave your email address so we can check. 2. Follow me on Instagram, leave your IG name so I can check if you win. Leslie is just like you and me. She has a day job but also has a fashion dream. She is working very hard to make her store better every day. Please support her if you can! 🙂 Thank you very much and good luck! Congrats on your Cliche Magazine feature! Love all of your Arm Charms bracelets! I’m heading over to check them out! 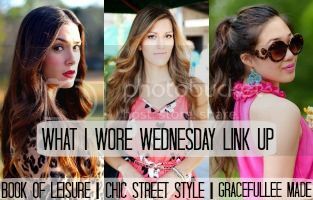 Thanks for the giveaway & linkup! First, I wanted to say thank you for hosting this link-up! These are such fun ways to get to know people better. Second, that floral dress is breathtaking. I mean you really look stunning in it. I added my link and I tried to add you on Facebook but it didn’t give me the option. So instead I shared this link on Facebook. I also tried to link back to this page on my website, though I’m not sure if I did it right, since this is my first week doing link-ups. Hope you’re having a fantastic day! Love the flower dress, you look so beautiful! Lol @ longer than some relationships. I love your floral dress. It’s super cute and with those shoes -perfection. Thanks for hosting and have a wonderful Wednesday. Congrats on the feature! Love every single outfit, so chic as always! That dress is divine. I love the sleeves and colors. So pretty. Gorgeous shoes, also. How do I enter the giveaway? They say the strongest relationships are forged over shared ‘firsts’ – YOU were MY first blogger! Very proud of your dedication and effort. Congrats on your feature! I love your floral dress. What a gorgeous dress! I love how you paired it with the yellow shoes! Thanks for hosting! Congrats on your feature! That is so exciting! Love all the jewelry! Congrats on the magazine feature! What a lovely dress and bracelets! Congratulations on this feature sweetie – you are indeed a delight to the eyes! What a nice story! It’s really nice to hear how you became friends with the shop owner. This is so lovely when you’re able to connect with the person behind a brand’s name. I enjoy your blog and I think you’re doing the blogging gig absolutely great. Looking forward to reading more of it! Congrats on your magazine feature, thats amazing!! I love your floral dress, it fits you perfectly and is such a great pattern. 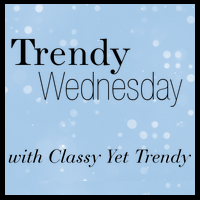 Please stop by our blog and join our Tuesday Fashion Party Link up. We’d love to have you join. I loved working with Leslie as well! I am glad you two have a working relationship/collaboration still as I can;t get enough of the bracelets and love seeing them styled on others. You look lovely in all of these photos too! Congratulations on your feature for Cliche magazine too! Love your floral frock – so pretty! So many cute arm candies!! Love the colorful charms you have! Thank you so much for hosting, was a big pleasure to be a part of your link up this week. Congratulation! Your blog is lovely! Hi lovely, Congratulations on your feature! Keep up the great job!! Congrats on the interview and thanks for hosting. Congratulations Grace!!! You look gorgeous XO! Thank you for the linkup. WOW! That’s amazing -congratulations on the features so exciting!! Love your Valentinos by the way! What great times for you! Congrats on the magazine feature! I love the colors and details in those bracelets. And My Arm Charms is such a cute name for that company! Thanks for the link up! That’s awesome, cheers to your feature and I applaud your growing partnership! CONGRATS! So excited for you. Those bracelets are beautiful and I love your Movado watch, too! Hey doll! Thanks for inviting me to join your link up. And I LOVE your arm candy so count me in to win some bling!! LOL! I’ll be stopping by more often. Thank you again. And please stop by my blog & leave a comment to let me know you were there. Have a great week girl!! Congrats on your feature! I have never heard of that magazine so I will be checking it out! Love all the jewelry! They sure make any outfit better! Oh wow, congratulations on the feature and collaboration! Congrats on the blogger spotlight, babe! That’s amazing! congratulations for the great opportunity dear…. how fun and exciting! the spread looks fantastic! Thank you so much for inviting me to take part in your link-up, Grace! I’m always happy to find new blogs and link-ups. BTW, that bag of yours is really cute! Congratulations on this huge achievement! Finding good sponsorships can also be hard, but once you get them it is amazing. You look great! congratulations on your feature in the Magazine! That’s so crazy that you’ve only been blogging 9 months, I would’ve thought it was a lot longer! I love those bracelets, hard to believe they’re under $10!